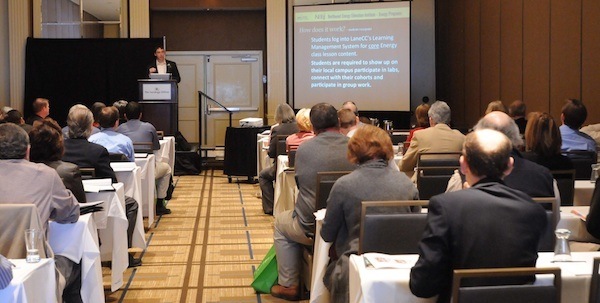 As in years past, an extensive offering of technical, hard-to-find, and thought-provoking workshops will be offered at the 2012 Clean Energy Workforce Education Conference. All workshops will be held at The Albany Marriott on November 13th. Here’s what’s up for 2012. This workshop will cover how changes in the 2012 National Electric Code, International Building, Residential and Fire codes impact photovoltaic (PV) design and installation. The latest code changes and their effect upon design practices will be discussed in detail. The Instructor will show common mistakes in PV installations, methods for identifying them, and how they can be avoided. The target audience should have an intermediate level knowledge of photovoltaic systems and need or desire knowledge of current and impending changes to fundamental design and installation practices. This course is registered for 6.5 NABCEP Solar PV Installer Certification Continuing Education Credits. Full day. Intermediate to Advanced Workshop. $175. About the Instructor: Christopher Warfel is the principal of Entech Engineering, Inc. Since 1989, Entech has provided administration and strategic consulting services for energy conservation/utilization, and renewable energy programs for the U.S. Department of Energy, electric utilities, industry, and state agencies. Entech provides inspection, design, design and econometric review, and installation of renewable energy technologies. Warfel has inspected over five-hundred renewable energy systems in the past five years. Warfel is a North American Board of Certified Energy Practitioners (NABCEP) committee member, with a BS in Forestry Engineering from SUNY Syracuse and Syracuse University, and an MS in Mechanical Engineering from UMASS-Amherst. About the Instructor: Vaughan Woodruff is a NABCEP-Certified Solar Heating Installer™ and educator. He was lead instructor of the Northeast Solar Heating and Cooling Instructor Training Program, which worked to integrate solar heating technologies into traditional vocational education programs in New England and New York. Additionally, he wrote the NYSERDA Field Inspection Manual for Solar Heating Systems and co-authored the NABCEP Solar Heating Resource Guide. He currently serves as Adjunct Solar Heating Instructor at Kennebec Valley Community College in Fairfield, Maine. About the Instructor: Roger Ebbage holds an interdisciplinary Master of Arts degree in Environmental Studies/Industrial Arts. He is an Association of Energy Engineers Certified Energy Manager, a California Certified Energy Auditor, and a Bonneville Power Administration Certified Energy Auditor/Inspector. Ebbage has been the Energy Management Program Director at Lane Community College in Eugene, Oregon since 1992 and has made the program a national model for energy education. Ebbage founded and serves as Director of the Northwest Energy Education Institute. About the Instructors: Craig Clark PE is the Dean of Applied Technology at Alfred State College. He has been Dean since 1996 of the Wellsville, New York campus that has over 800 students in the skilled trades. He is responsible for developing the emphasis on energy efficiency and renewable energy at the Wellsville campus and directs the college’s Renewable Energy institute. Additional faculty will present including Professor Jeffrey Stevens of Construction and Maintenance Electrician and Dave Kostick, Electrical Engineer, at IMT Solar. IREC is setting the standard for quality training in renewable energy and energy efficiency. An IREC credential is a valuable mark of recognition for training providers looking to attract students and clearly show that their program meets a recognized set of robust standards for renewable energy or energy efficiency training. This workshop will step through the requirements for training programs and instructors to achieve an IREC ISPQ Credential, provide helpful tips for completing a successful application, and provide information to differentiate between the two IREC Standards for quality training. Informational half-day workshop (afternoon). No charge. About the Instructors: Pat Fox is currently the Director of Operations for the Interstate Renewable Energy Council. In this role, she is managing IREC’s Credentialing Programs. Fox is an IREC ISPQ Registered Assessor and serves on the IREC Standards Development Committee. She is a founding member and was the first Chair of the Waltham Energy Action Committee for the City of Waltham, Massachusetts. She has published articles and spoken nationally on credentialing of renewable energy and energy efficiency training providers and is the lead author for IREC’s Solar Licensing database. Additional presenters from IREC’s ISPQ Credentialing Program include Laure-Jeanne Davignon, Kristen Ferguson and Diane DePuydt.